Between 1801 and 1807, four of the largest or brightest asteroids had been discovered: Ceres, Pallas, Juno, and Vesta. Since 1594, when Johannes Kepler predicted that there should be a planet between Mars and Jupiter, astronomers had been searching for that “missing planet.” When Giuseppe Piazzi discovered Ceres in 1801, the scientific world thought that he had ended the search. Then Ceres disappeared from sight, only to be recovered one year later. Astronomers breathed a sigh of relief and celebrated! The “missing planet” was back! Wilhelm Olbers, an amateur German astronomer who was a doctor by profession, was again looking for Ceres about three months after it had been rediscovered. That was when he saw another moving object nearby! This “object,” which was later named Pallas, caused quite a stir in the astronomical community. Only one planet had been expected in the space between Mars and Jupiter. When Gauss calculated this new object’s orbit, he found that both Ceres and Pallas took 4.6 years to revolve around the sun. He also found that Pallas could be seen from the Earth for only a small portion of that time. It was incredible luck and timing or, maybe astronomical serendipity that Olbers was looking for Ceres during the short period of time that Pallas happened to be passing near Ceres. Otherwise, Pallas might not have been observed for many years. In 1802, William Herschel tried to measure the sizes of both Ceres and Pallas. He did this by looking at each “planet” through a telescope while comparing it to a disk of a known size at a given distance. He was very surprised that these “planets” were so much smaller than the other known planets. Herschel was the first to call Ceres and Pallas asteroids because of their small but “starlike” appearance. How many more fragments are out there? As often happens, the results of this scientific discovery led to further questions. Could there be more than two asteroids? 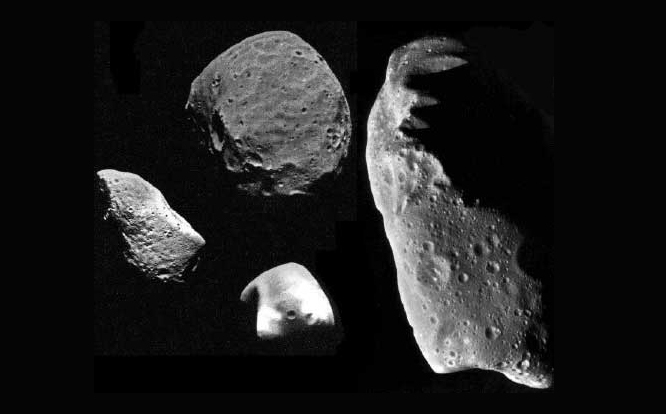 Where did these asteroids come from? In 1804, Olbers formulated the first and oldest theory about the origin of asteroids in a letter to Herschel. He wrote, “Could it be that Ceres and Pallas are just a pair of fragments…of a once great planet which at one time occupied its proper place between Mars and Jupiter?” If this were the case, Olbers believed that many more asteroids would be discovered. Other astronomers thought that asteroids were pieces of a planet that never formed. They estimated that there were ten more asteroids. Olbers’ belief that there were a great many asteroids to be discovered reactivated the Celestial Police. They again made careful observations of promising regions of the sky at Johann Schröter’s private observatory at Lilienthal. This was one of the largest observatories in the world at that time and was very close to Bremen where Olbers lived and worked. Karl Harding discovered a third asteroid, named Juno, on September 1, 1804. However, it was much smaller than either Ceres or Pallas. Not only did Olbers predict there were many more asteroids, he proposed a theory about where these undiscovered asteroids could be found. Olbers thought that the asteroid fragments of an exploded planet were now in different orbits around the sun. Furthermore, he even predicted a point at which these various orbits would intersect.. When he searched close to this point, he discovered Vesta on March 29, 1807. Olbers became the first person to find two asteroids. So, by 1807, the two asteroids to be closely observed by the Dawn spacecraft had been discovered. As it turned out, the discovery of Vesta brought the first era of asteroid discovery to a close. Since the four largest and brightest asteroids had been found, additional asteroid discoveries would depend on more advanced telescope technology. In 1813, the French army burned the city of Lilienthal as they retreated from Russia. All of Schröter’s books and observation records were destroyed and his observatory was looted. The Celestial Police disbanded and Olbers continued his lonely search of the heavens until 1816, when Schröter died. No more asteroids were found during the period between 1807 and 1845. This history lesson is part of NASA’s Dawn Classroom. The entire package of free lessons is available at http://dawn.jpl.nasa.gov/DawnClassrooms/1_hist_dawn/index.asp.